From almost the day CKCO signed on, until illness forced her retirement in 1971, Elaine Cole was a major attraction in CKCO’s daily local programming line-up. Elaine was well known locally through her roles in various organizations when CKCO recruited her to host their public service and ’women’s interest’ programming. 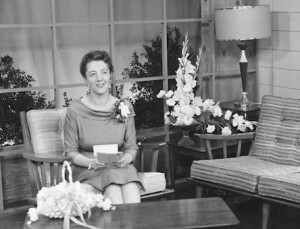 First with a half hour, then expanded to one hour, live, daily Elaine mixed interviews with local groups promoting current activities, visiting celebrities and dignitaries, show headliners, authors, new product demonstrators, discussions of timely issues, and showcasing local talent in a variety show format, so popular guest spots on her show required three and four weeks advance booking. On air, Elaine was backed by studio musicians Joe Carlo, then George Kadwell, finally Pat Ludwig, and, in her last two years on air, with myself as co-host/co-producer. For program management, Elaine’s show was a ratings booster, moving from mid-afternoon to late morning as CKCO’s programming schedules expanded, positioned as a good run-up for shows that followed her. When CKKW radio was added to the Central Ontario roster, Elaine did an initial daily hour on radio as well as her television show. In 1971, Elaine was stricken with rheumatoid arthritis, its onset so sudden and its progress so relentless that Elaine’s on-air career disappeared virtually overnight. While still able she took on a role as a spokesman locally for the Rheumatoid Arthritis Foundation, eventually that becoming too onerous, her last years confined to a wheel chair. Elaine’s home-life revolved around her mother, son – actor Bill Cole, – daughter Helen, grandchildren Trevor – as a novelist, twice shortlisted for the Governor General’s Award, and Valerie, formerly a CHYM radio personality.